Thousands of runners visit every year to compete in top-notch races such as the Big Sur Half Marathon on Monterey Bay. Even when it&apos;s not race day, the Monterey Peninsula is the top destination for the avid or casual runner. We polled running fans both near and far to compile this list of favorite runs on the Monterey Peninsula. Don&apos;t forget to pack a pair of running shoes for your next visit! 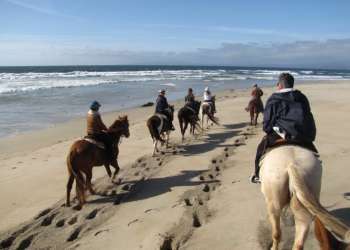 The beaches from Monterey to Moss Landing offer miles of beautiful scenery and uninterrupted sand. For runners who would rather run on sand than pavement, these beaches are perfect. The gentle angle on the beach along this particular route is ideal for beach runners of all skill levels. For the most challenge, run along dry sand. Begin at Del Monte Beach, right next to Wharf #2 in Monterey. Run with the ocean to your left. For a 2.5 mile run, turn around when you reach the Monterey Tides Beach Resort. Depending on the day, you might see surfers on the beach, kites or parasailers near the or sailboat races on Monterey Bay. This captivating run along Carmel&apos;s low-traffic paved roads shows off the natural beauty that inspired the poetry of Robinson Jeffers, as well as the fairytale cottages for which Carmel-by-the-Sea is so well known. Begin on Ocean Avenue in front of the Pine Inn. You&apos;ll have a brief downhill run to Scenic Road, where you&apos;ll turn left. From here until the last two blocks of your run, the route will remain fairly level. Keep the ocean on your right for just over a mile as you run the coastline, starting next to famous Carmel Beach. You&apos;ll then pass by architectural wonders including the Walker Residence, built by Frank Lloyd Wright, and you&apos;ll catch a glimpse of Jeffers&apos; Tor House and Hawk Tower. Scenic Road will curve to the left at the edge of Carmel River State Beach, where it runs into Carmelo Street. Follow Carmelo Street back through the outlying areas of Carmel. You&apos;ll know when you return to Carmel-by-the-Sea by the distinctive stenciled street signs and the bucolic fairytale cottages. Turn right when you reach Ocean Avenue to return to your starting point. If you&apos;re staying in downtown Monterey, you&apos;re just steps from the start of this route. (Staying in Pacific Grove? You can do this route in reverse by starting at Lovers Point.) This run is gentle, level, and on the Monterey Bay Coastal Recreational Trail, which does not allow motor vehicles. The route is paved, but many sections offer a substantial dirt lane right next to the paved trail. 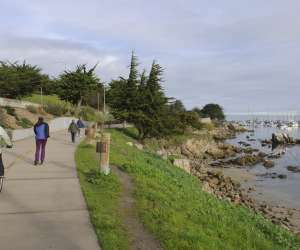 This route begins just steps from the foot of Wharf #2 in Monterey, on the Monterey Bay Coastal Recreation Trail. You&apos;ll first pass Fisherman&apos;s Wharf; as you hear the sea lions barking, imagine that they&apos;re a crowd cheering you on. For about a quarter mile, you&apos;ll have an uninterrupted view of Monterey&apos;s harbor. You may see scuba divers suiting up as you run past San Carlos Beach. As you reach the Cannery Row area, you&apos;ll have intermittent sweeping views of the harbor while you pace by some of Monterey&apos;s most popular restaurants and historic cannery buildings. At the Monterey Bay Aquarium, the path curves gently to the left, skirting the ticket line and heading back toward the coast. On a clear day, you&apos;ll see all the way to Santa Cruz as you run the final mile toward your turn-around point. Need a breather before you head back? The park benches at Lovers Point Park offer great views of the kayakers launching from the beach below. Many soldiers based at the Defense Language Institute, as well as locals looking to stay in peak shape, run variations on this route as part of their fitness regimen. This paved route brings together several recommendations for a route that starts easy and ends with a thigh-burning hill climb. Start, as the soldiers do, at the back gate to the Presidio. You&apos;ll run through several of Pacific Grove&apos;s neighborhoods on your way down the hill to Asilomar State Beach. The route continues along the entirety of Pacific Grove&apos;s breathtaking coastline. Shortly after you run by the Monterey Bay Aquarium, turn right onto Prescott and prepare yourself. You&apos;ve got one mile to go, and in that mile you&apos;ll regain all the elevation that you lost over the previous six miles. There&apos;s often a soldier running the same hill to commiserate with - that is, if you had the breath to talk! This golf course-to-golf course run along paved roads shows off the Monterey Peninsula&apos;s legendarily beautiful scenery. Plus, since you&apos;re almost always running along the ocean, it&apos;s nearly impossible to get lost. As one fan noted, "It has trails, trees and shade, road, surf and sun. If you run it in the evening, you will almost always see a deer or two. It&apos;s just a splendid run!" Start in Pacific Grove next to the Pacific Grove Municipal Golf Links at the intersection of Sunset and Lighthouse. The breathtaking ocean views begin immediately as you run along Sunset with the ocean to your right. You&apos;ll run past magnificent Asilomar State Beach, then turn inland as you head slightly uphill. Pass the Fishwife and take your next right onto 17 Mile Drive. Cars may have to pay a toll here, but runners pass through for free! 17 Mile Drive has excellent signage which will keep you pointed in the right direction. Run along the cypress-lined road as it curves around The Links at Spanish Bay and heads back to the coast at Point Joe. You&apos;ll have uninterrupted views of the magnificent Pebble Beach coastline on your right and the tony Monterey Peninsula Country Club Dunes Course on your left as you head toward Bird Rock. The Bird Rock Area is fully equipped with benches and binoculars for admiring the view. Better yet, it&apos;s got restrooms, making it a perfect pit stop before you head back. To go the extra mile (literally), run the added loop around Pacific Grove Municipal Golf Links on your return.